Posted on Mon, May 3, 2010 : 2 p.m.
Just around the corner from my home, I have been enjoying a front lawn filled with glorious bright yellow flowers. I had been admiring their color, the bees that were visiting (some from my own hive I was guessing), and could almost taste the bright, bitter, full flavor of the leaves, the crunch of the darkly earthy and sweet roots. A few days ago I rounded that corner to the acrid odor of chemicals. The lawn was laid to waste, every flower dead, the plants laid flat in a gory mess of poisoned turf and green. Days later and the chemical odor is still obvious. The dandelion, Taraxacum officinale, was intentionally brought to the U.S. hundreds of years ago. Valued for food and medicine, it joins a host of other “weeds” in people's lawns that have been targeted - somewhat bizarrely - as noxious and even embarrassing. Dandelion, chickweed, plantain, chicory, yellow dock, lamb’s-quarters, purslane, amaranth and mallow are just some of the common weeds that actually have great value. Also, these plants being exterminated with toxic chemicals that we know are harmful to children and pets. These plants disturb the monotonous symmetry of a solid lawn of green grass, which requires chemicals, time, money and mowing to keep pristine. This is a high cost for eliminating the valuable plants, for the achievement of what many claim was just the simple ornamentation and proof that one can afford to keep a lawn. Somehow it has become part of our culture to celebrate grass rather than the diversity of plants that naturally grow, or better yet a native micro-culture of meadow (that would in time replace the above mentioned weeds) and even in the city would benefit a multitude of insects, bees, birds, and other aspects of the environment. Well that’s the negative rant. What is so great about dandelions? A bitter green, the leaves can be used in salads, in stir-fries, as a pot green mixed with other vegetables, or as a garnish on sandwiches - yep, even on your hamburger in place of lettuce. I blend them into homemade salad dressing, in dips, and have even made spanakopita with dandelion greens in place of spinach. Would that make it dandekopita? I don’t know. But they are also a regular part of my summer salads, and when I have enough, it's a delight simply cooked Greek style with olive oil and garlic. Yes, in most Greek restaurants you can find dandelions on the menu. Like other bitter greens, dandelions help stimulate digestion when eaten a few minutes before or during a meal. They contain more beta carotene, which the body converts to vitamin A, than carrots. The leaves are also high in calcium and other minerals, and antioxidants. They contain vitamin C and act as a mild diuretic. The leaves and rots also provide nourishment for the liver. And of course dandelion wine can be made from the flowers, which is also enjoyed as a digestive aid and a pleasant beverage. All parts of the dandelion are edible at all times of the year. The leaves of most (but not all) varieties are more bitter midsummer and around the time of flowering. They are the most palatable in the spring and fall. The roots are harvested in the spring and fall for their medicinal value and can be preserved in alcohol (I use 100 proof vodka) or in vinegar. The vodka makes a tincture, used a few drops at a time. The vinegar creates a sort of pickle, the root can still be eaten for the flavor but the resulting vinegar is a mineral rich potion enjoyed for its bio-availabilty. I pick the flowers and shred them into salads (an entire dandelion blossom can be a little overwhelming for most people). Combined with violets, mustard flowers, the red buds I wrote about a few days ago, and other flowers it is a lovely little riot of color in your salad bowl. The yellow looks lovely against the many shades of greens in my salad. Because so many people use poisons on their dandelions, don’t pick them unless you know the lawn is chemical free. Don’t pick them near railroad tracks, as they are frequently heavily sprayed. The same goes for dandelions under high-tension power lines. Unfortunately apartment complexes, manufactured home parks, condo associations, and other places that are “managed” also tend to spray to eliminate the valuable weeds. Don’t risk harvesting from there unless you know for sure it is safe. This is a beautiful, helpful, tasty and beneficial plant. Yes, it is a non-native and mildly invasive. The best way to control it? Dig it up and eat it. But if we want to do better in caring for our environment, we need to rethink the whole idea of lawns and grass. You can start just by letting a few dandelions live. At least until you eat them. Linda Diane Feldt is a local Holistic Health Practitioner “providing an integrated approach to holistic health care since 1981." Linda Diane has no lawn, and grass is the most invasive plant in her yard. Follow her on twitter, contact her at ldfeldt(at)holisticwisdom.org, or view her website. Her next FREE class offered through The People's Food Co-op is May 27, from 7-8:30 at Crazy Wisdom Bookstore. The topic is local medicinal plants. Fri, May 7, 2010 : 12:05 p.m.
We stir-fry/steam the leaves with garlic, chicken stock and a touch of toasted sesame seed oil...is delish. When the plants get to big/tough our house rabbits relish love 'em. Thu, May 6, 2010 : 3:36 a.m. Some 40 years ago, I first tasted dandelion. IN France, I had a salad made of fresh leaves in a mustard dressing mixed with hard-boiled eggs chopped into pieces. The eggs reduced some of the bitterness of the leaves. Tasted great! Wed, May 5, 2010 : 9:25 a.m.
A Beth: Probably a bit off topic - but - when my daughter was quite young we lived outside of town and I'd drive her into Chelsea for school in the morning. In the spring she'd always look at the pretty yards and flower gardens that were coming up all along main street. Such perfectly green lawns. One morning she said: I really feel sorry for the people here Mom. I asked her why and her reply was: They don't have any of the beautiful yellow flowers we have all over our lawn. At that point - her Dad and I had been talking about perhaps 'doing something' about the dandelions on our yard - but having small children and pets made us hesitant to put any type of chemical on the lawn for safety reasons. After I shared her 'insight' with my husband we decided that 'beauty' was more important than what anyone thought about our very brightly colored yard. I've never quite though of dandelions as a 'blight' since that day. Tue, May 4, 2010 : 5:22 p.m. Thanks for this needed story about dandelions. 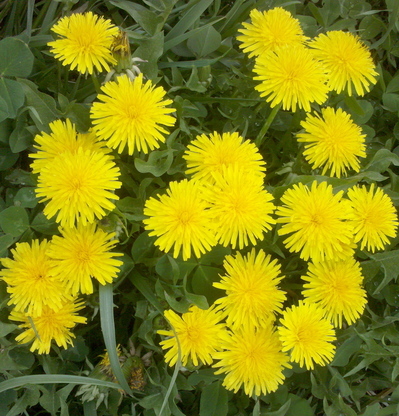 I am dying to make dandelion wine, but don't know where I can find enough non-pesticide treated flowers! Tue, May 4, 2010 : 2:32 p.m.
A GREAT story. I have always thought dandelions were beautiful and wondered why people got so bent out of shape if they had them in their yard. They would rather poison the earth with harmful chemicals I guess! I have, in the past, made a dandelion wine that was delicious. It was thick and sweet, sort of tasted like Harvey's Bristol Cream. You just use the blossoms. If you get a little of the greens in there, it could take the enamel off your teeth! Tue, May 4, 2010 : 8:16 a.m. Yes, the entire plant is edible. The root can be roasted (chop it and place in 200 degree oven for about 2-3 hours)and then ground for a coffee substitute. Although I agree, there is no real substitute for coffee. Warning - this can bring out some of the diuretic effects. The flowers, as I mentioned, and of course the leaves which are mineral rich and great for you as are so many dark green leafy greens. The stems? Well they don't taste as good, and I generally leave them out, although a small percentage mixed with greens is OK. @KRC I'll write about purslane later, is is high in Omega 3 precursors, far better than flax seed, so it is a very valuable plant. I can't get it to grow in my yard though. There is a lot of it growing downtown, in the cracks and crevices. If you choose to eat it wash it well. Since I have a dog I realize that exhaust and dirt is not the most likely contaminant that downtown plants are subject to. I didn't know you could eat the whole plant! I knew about the early leaves and have enjoyed them, kinda grazing along picking them and popping them in my mouth. Also purslane! I always surprize my friends when I see it growing out of the cracks of a sidewalk and pick it clean it off well and eat it. It is one of my favorites. Tue, May 4, 2010 : 7:25 a.m. Thank you for the comments. I've received more than a half dozen personal e-mails as well, all from people confessing to their love of dandelions. I hope that it is a growing sentiment. I will confess that I've stopped to talk to people I've seen weeding them. My opening line "you know you can eat those". A few people have continued the conversation, a few have made it clear they don't want to talk. @alterego almost anything will taste god breaded and fried. Euell Gibbons was a fan of that method, I never have been. I find it hard to taste the plant amidst the fried part. Since you can, I'm curious about your recipe. Changing public opinion about dandelions is a small act, and not a high priority for anyone. Yet it can make a real difference coupled with stopping chemical use, changing how we use land, and eating more dark green leafy vegetables. Thanks for supporting the cause! Mon, May 3, 2010 : 11:32 p.m. I occasionally enjoy dandelion flower fritters. Breaded and fried, the flowers provide an unique flavor and texture to the dough. Question: What can be done with the dandelion flower stem? Is that part edible? Mon, May 3, 2010 : 10:38 p.m. I saw a woman with a bunch of dandelion greens at the store... I had to chuckle to myself - she can come to my house and pick all she wants for free! Young fresh dandelion greens are a really good addition to a simple salad, I like to toss in a few fresh strawberries (cut up), some blue berries or raspberries and some pine nuts or pecans - I prefer a honey mustard dressing - but my kids like a simple vinegar and oil mix. Some of the flavored oils make a good dressing. Mon, May 3, 2010 : 3:05 p.m.
Great article! I recently boiled some dandelion leaves for the first time and seasoned them with a little butter, salt, pepper, and some green onions I found growing nearby. It turned out pretty tasty. I hope that people will think twice before killing this plant and discover how delicious and useful the dandelion is.